Wait, you didn't think it was only humans who could love Star Wars, did you? How horribly speciesist of you. 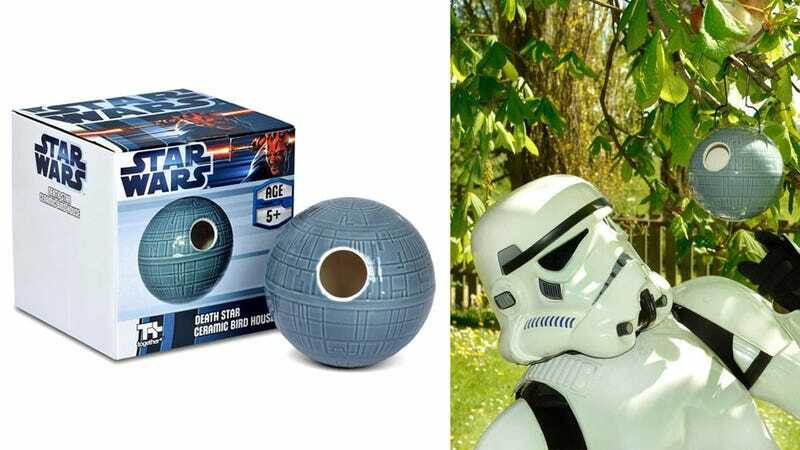 There's no reason to believe that the other creatures inhabiting our tiny corner of the galaxy don't appreciate a good space opera too, and if you've noticed the local sparrows crowding around your window whenever you pop in Episode IV, there's s good chance they'll love this Death Star bird house. Made of sturdy ceramic, this smaller version of the infamous space station lacks a volatile core so the risk of it exploding and destroying a nest are minimal. For $40 it comes with a wire hanger for securing it safely to a tree branch making it the perfect home for your backyard birds, as long as you can convince them it's not a trap.